We’re exploring passages from John’s gospel this Advent season that relate to what Jesus’ coming was all about. The first Sunday of Advent, we learned that Jesus’ followers should expect persecution. Last Sunday, we explored the meaning of the incarnation. Today’s passage builds on the incarnation theme—that in Jesus Christ, God was in the flesh. Although we don’t know the date of Jesus’ birth, this is a passage we can date as occurring very close to our Christmas season. It takes place at the Festival of the Dedication, also known as Hanukkah (the Hebrew word for renewal). By the way, Hanukkah this year, which our Jewish neighbors and friends will celebrate, closely aligns to Christmas. It begins on Christmas Eve, the 24th and runs through New Year’s Eve. The background of Hanukkah comes from the intertestamental period, between the last of the Hebrew Scriptures or the Old Testament, and the coming of Christ and the New Testament. The story of what happened is told in First Maccabees, which is found in the Apocryphal. These books are not a part of the Protestant canon, or Bible. Nor are they in the Jewish Scriptures. The Catholic Church accepts them as scripture and you can find them in Study Bibles. It isn’t that the books were false that kept them from being accepted into the canon of Scripture, but that they were not considered necessary for salvation. However, they do shed light on what happened during this period of nearly 4 centuries. In the Second Century BC, King Antiochus of Syria, who ruled over Israel, sought to do away with the Jewish faith. He outlawed the practices of Judaism: the sacrifices in the temple, the keeping of the Sabbath, and circumcision. To really make his point, he turned the Jewish temple into an altar for Zeus and, just to rub their noses into the dirt, sacrificed a pig on the altar. Needless to say, this incensed the Hebrew people and a group revolted and drove the Syrians out of Jerusalem. Then they had to deal with the temple that had been profaned. They destroyed the old altar, built a new one, and the cleansed the temple. There was an eight day period of cleansing, but they found there was only enough oil for the lamps for one day. God provided and the one day’s worth of oil burned for eight. Move forward to Jesus’ time. Rome, another foreign power, brutally controls Israel with an iron hand. The Festival of the Dedication, in which they recalled how God had saved them in the past, becomes a time in which the Jews look for the coming of the Messiah. This explains why Jesus is being hounded as to whether or not he’s it. Read John 10:22-39. We’re finally enjoying some cool air. And when the wind stirs a bit, the air has a bite to it. If we’re outside, we want to be moving around to stay warm and perhaps find ourselves a place where we can be protected from the wind and enjoy the sun. Jesus was no different. Winter in the holy lands can be quite chilly. Normally, teachers like Jesus would sit and his students would stand around him, but when the air temperature dips and in the mornings you find a thin sheet of ice in the pools, sitting isn’t a pleasurable option. You move around. You head to the side of the temple facing the sun, where the large stone walls and columns block the wind. There, Jesus walks for warmth, while being hounded by people. A day or so before, he taught them about the Good Shepherd, a lesson that had many of the Jews upset because he implied their leaders were not good. But some wondered if Jesus could be the Messiah. After all, he’d first need to clean house, wouldn’t he? Is he the Messiah? If the Messiah is to come, the Festival of the Dedication or Hanukkah, would be an appropriate time. This is a holiday about renewal, getting back on the right track. Let’s kick these Romans out and establish God’s rule! But as is common in John’s gospel, Jesus doesn’t directly answer those who are hounding him. In fact, Jesus’ answers are equivalent to throwing kerosene on a fire. Jesus blames them for not understanding what he’s already taught and points to the good work he’s done. Some of these good deeds have already gotten him in trouble because he had the gall to do them on the Sabbath. Now he tells them they don’t believe because they are not his sheep. Although this passage certainly could be used to support predestination, God’s knowledge of and control over salvation, perhaps it is best to err on the side of one commentator who said this passage points out “that the deity is far more powerful than humanity.” God is more powerful, more knowledgeable, than me and you. There are three things those who are Jesus’ sheep, those who believe in Jesus, will do according to verse 27. First of all, we will listen. We will hear his voice. Next, Jesus will get to know us. And finally, as this relationship grows, we will follow Jesus. Then there are two promises for those who hear, develop a relationship with and follow Jesus. We will be given eternal life and will be protected. All this, Jesus can do because, as he says in verse 30, he and the Father are one. With that last comment, the crowd that has gathered around Jesus is about to riot. Certainly Jesus knows what’s going on, but he asks them a question to force them to be honest. “Are you going to stone me because of my good works?” They must realize that if they are going to kill him, they are killing a good man, one who has helped the helpless, those in need, those who are ill and dying or blind. But it’s not Jesus’ work that bothers them, it’s his incessant that he is one with the Father. John’s gospel, as we saw last week, wants to emphasis this point—the incarnation—God and Jesus as one. But to those who do not believe find such talk blasphemous. Jesus, in justifying his assertion that he is one with God, quotes from the 82nd Psalm, which we heard read earlier. That Psalm, in which God (with a big G) stands in judgment over gods (with a little g), is interpreted as an indictment of Israel. Failing to do the merciful work assigned to them—rescuing the weak and needy and protecting them from evil—they are destined die as the consequence of their sin. Again, Jesus recalls the good work he’s done and suggested that even if they don’t accept him for who he is, that they at least accept what he’s done. But the crowd will have none of it and attempt to arrest Jesus. But as he has done before, Jesus alludes their capture. It is not yet his time. 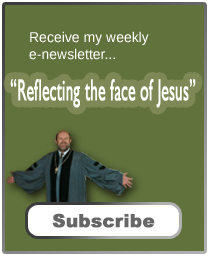 In a manner, as I tried to impress upon you last week, Jesus is more than just a Savior. He is God incarnate. And to those of us who hear his voice and draw near and follow him, Jesus offers eternal life and promises to be with us. But we have to be devoted to him. We can’t control Jesus or put him into a box to be kept on a shelf until needed, as those in the first century desired. In this passage we see how the Jews who hounded Jesus suffered from a tunnel vision which kept them from seeing the truth that was in front of their eyes. We must always remember that we are to follow Jesus. He didn’t come to follow us. We must be willing to accept him on his terms, not ours. As the old gospel hymn goes, “All to Jesus I surrender, All to him I freely give… I surrender all, I surrender all, all to Thee, my blessed Savior, I surrender all. As we come closer to the day we celebrate Jesus’ birth, do we surrender all? Do we trust God and his mysterious ways enough to follow Jesus? If so, listen to Jesus, develop a relationship with him, and follow him. Amen. Frederick Dale Bruner, The Gospel of John: A Commentary (Grand Rapids: Eerdman, 2012), 634. The background for Hanukkah, as well as other insights in this sermon, I am indebted to a Christmas Eve sermon on the passage by the Rev. Paul W. Manuel, retired pastor of the German Seventh Day Baptist Church of Salemville PA on Christmas Eve 2011. See https://paulwmanuel.blogspot.com/2012/11/sermon-john-1022-39-light-on-messiah.html. See also Bruner, 640-641. Gerard Sloyan, John: Interpretation, A Biblical Commentary for Teaching and Preaching, (Atlanta: John Knox Press, 1987), 134. Bruner, 650. See also James L. Mays, Psalms: Interpretation, A Biblical Commentary for Teaching and Preaching (Louisville KY: John Knox Press, 1994), 268-271. For example: Luke 4:28-30 and John 8:59.